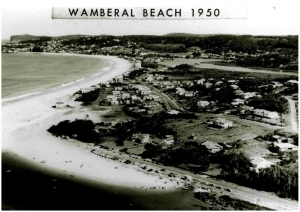 Wamberal SLSC has provided the community with a safe beach for more than fifty years. Being a community based volunteer organisation, the Club receives fantastic and generous support from the local residents and businesses of Wamberal and the surrounding area. Wamberal is a medium size club and is part of the Central Coast Branch of Surf Life Saving. The Club has a membership of 450, with approximately 110 members actively involved in lifesaving duties. Of the membership, there are about 380 nippers aged between 6 and 14 years of age. These “Nippers” provide the Club with an ongoing supply of active members to maintain the high standards which are an integral part of the Clubs history. Wamberal’s logo is the surf reel, a historical surfing aide used prior to the introduction of Inshore Rescue Boats and Jet-skis. We compete in the colours of maroon and silver. The club has a proud history in competition producing Olympians, World Surf Life Saving Champions, as well as numerous Australian and State Title holders. Apart from its primary role of ensuring that Wamberal Beach is safe for surfing, the Club is also involved in other activities. We hold the two longest running surf events on the Central Coast, the annual Masters surf carnival called the “Nutty Masters” and the Junior Ironman event referred to as the “Gardner”(named after its major sponsor Gardner Racing Boards). Both events attract a large number of surf life savers both young and old each which is testament to the organisation and teamwork which exists at Wamberal.